Do a search at Google today and you'll see a new link at the top of the page, "Show options..." That link opens up a whole new set of search tools that look like they'll be spectacularly useful and even a little fun. The tools let you find only results published in the past day or past week, find only results in forums, find only reviews, or get a sneak peek at the images on the pages in your results. 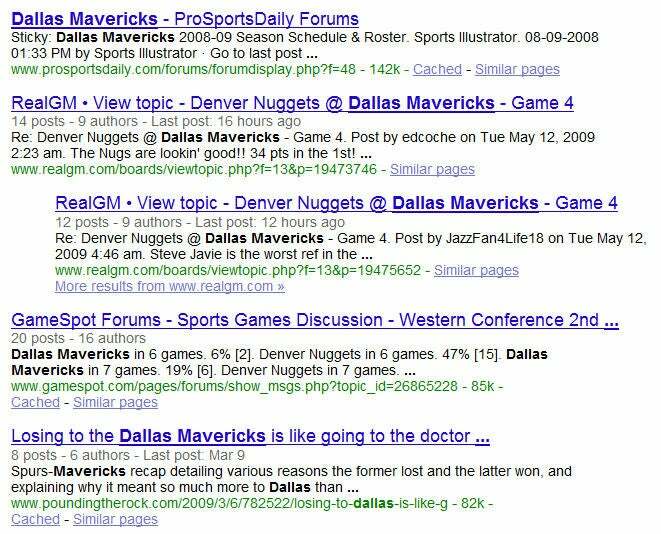 In addition, there are a couple of new ways that Google presents results visually. 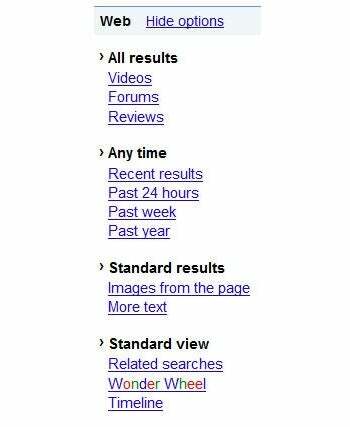 You can choose the Wonder Wheel, a visual search result that shows your central topic in the middle with spokes going out to related topics around its circumference. Or you can choose Timeline, which shows the number of mentions of your topic through history, and not just the Web's history. One example Google showed when they demoed Timeline included results back into the 1700s. Google announced the new additions at a press event at their Mountain View campus today. 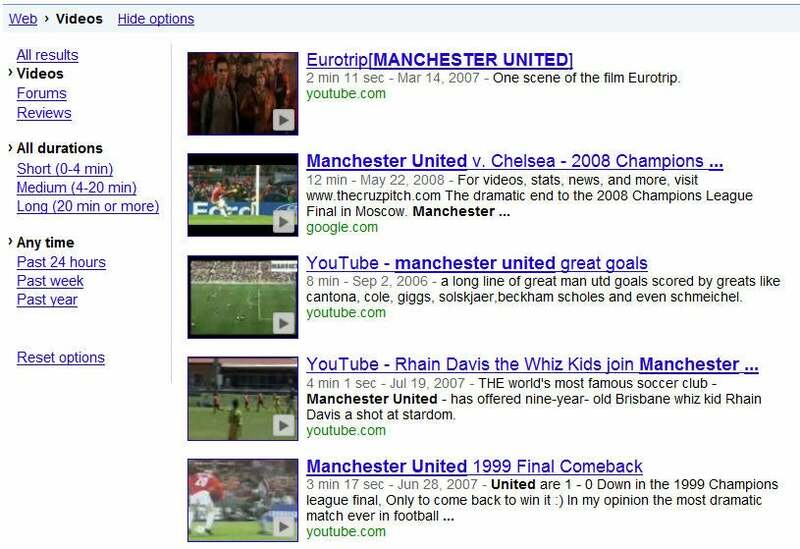 Of course Google has offered video specific search for quite a while. 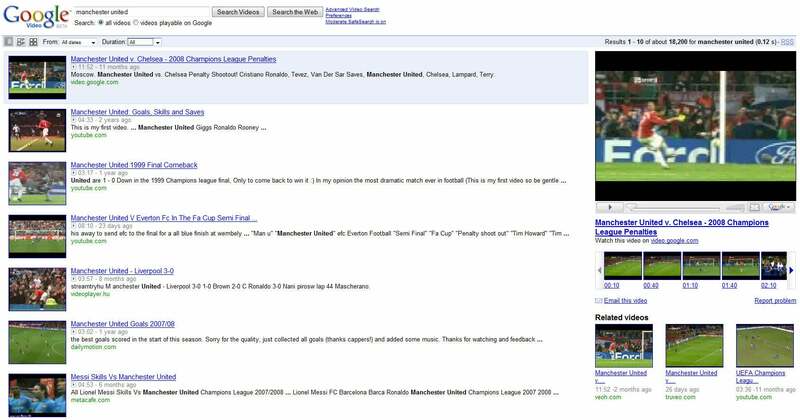 But the layout of video search results, and even the search results themselves, were different using the new video search option than they were simply going to video.google.com. In the new option the results are more compact and there's no built-in viewer on the page. As with video.google.com, you have options for searching for only recent videos and you can zero in on the length of video you want, short, medium or long. For comparison, here's the same search done at video.google.com. Forums search is really new, though. When you choose the forums filter, Google gives you results only from community forums and changes the information it delivers beneath each link, showing in some cases how many posts and authors on the forum and when the last post was made, so you can judge how active the forum is. The reviews filter will be very useful for anybody who is shopping on the Web. Enter a product name, choose reviews and you'll get links only to reviews of your product. Not only that but Google tries to divine the sentiment of the review, whether it's positive, negative, or neutral. There's no obvious indication of what the overall sentiment is -- no thumbs up or thumbs down, though that would be very cool -- but the snippets below the review try to pull out the salient points from the evaluation. 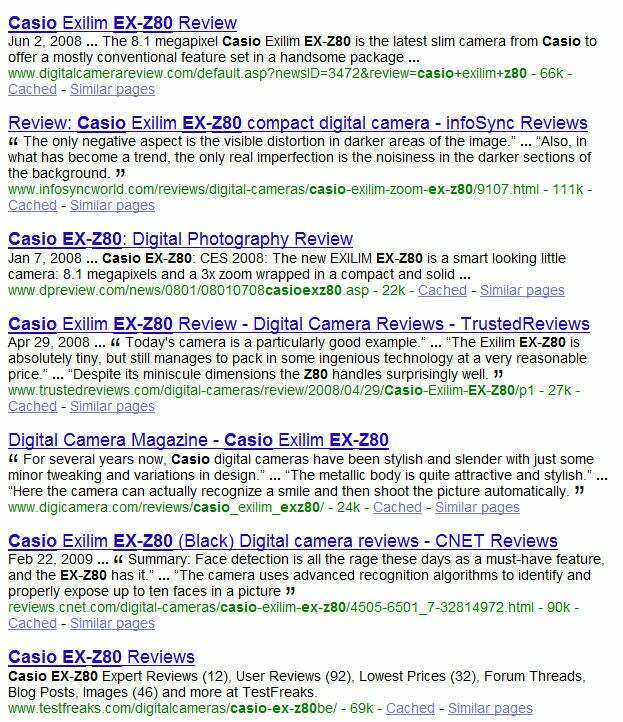 For instance, when I searched for the Casio EX-Z80, Google pulled these snippets from one of the reviews: "The only negative aspect is the visible distortion in darker areas of the image." ... "Also, in what has become a trend, the only real imperfection is the noisiness in the darker sections of the background."